If you want to test drive one of the safest vehicles on the road today come test drive the new Ford Edge in the San Francisco Bay Area. Towne Ford is pleased to announce that the new 2015 Ford Edge has just been awarded a five-star Overall Vehicle Score by the National Highway Traffic Safety Administration (NHTSA). This top government safety award is part of the NHTSA New Car Assessment Program. The five star rating is the highest possible rating from the U.S. government. The new Ford Edge has been completely reengineered and is loaded with convenient technology. Many innovative safety features have been integrated into the design of this popular Ford utility vehicle. Driver assist technologies such as adaptive cruise control and collision warning with brake support are examples of safety technology the NHTSA recognizes. Other significant safety features such as, curve control, side parking sensors, inflatable rear safety belts, glove box knee airbags, a new 180-degree front camera as well as a standard rear camera, also earned the Ford Edge accolades for superior safety. With seating for up to five, ample cargo space and a comfortable starting price around $28,000 the Ford Edge is an intelligent choice as a family vehicle. 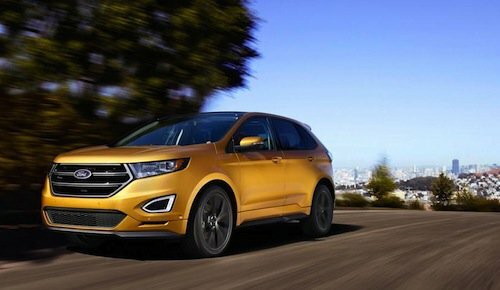 If you would like to learn more about this innovative new vehicle please stop by or Contact our 2015 Ford Edge dealers near San Francisco, CA.